Watching the world go by from the window of a train. The crunch of a pine forest beneath your feet. Making a fort out of the couch cushions. You’ve been inspired by discovery since you were knobby-kneed in the sandbox—whether that now means trying a new café, searching Reddit for epic catfails, treasure-hunting at the thrift shop, or wandering aimlessly in hidden nooks and crannies, giggling with the one you love. Adventure is a core part of who you are, especially when you get to share it with the person that makes you starry-eyed. 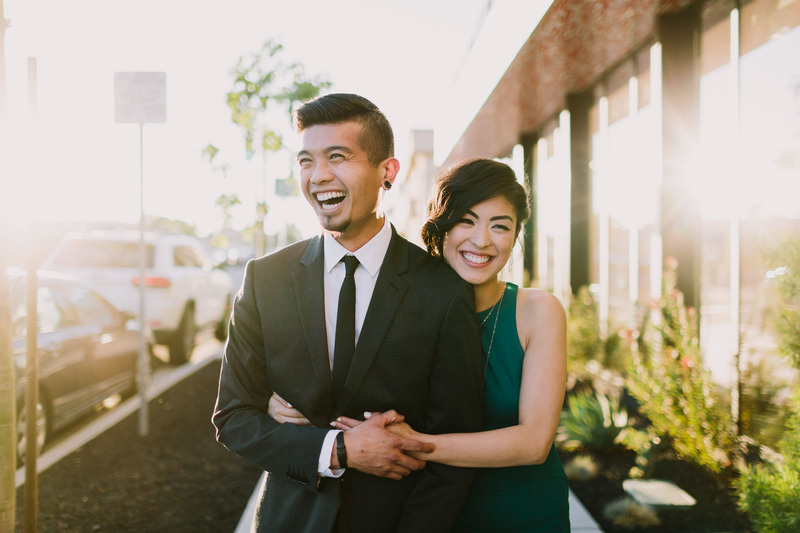 We travel all over, but as primarily San Diego, LA, and Palm Springs wedding photographers, we love embracing the laid-back California attitude that drew us all here in the first place. We won’t arrange you in fussy, uncomfortable positions or re-do fleeting moments—that stuff kinda makes us cringe. You’re quirky, nontraditional, and you don’t give a flying floozy about smoldering eyes or dramatic glamour. You definitely don’t want your wedding to feel like a performance. So let’s not make our time together about poses or contrived and meaningless props. Let’s make it about energy and misbehavior and feels and badass dance moves… all parts of that magical and intangible connection that ties you two together. Your relationship doesn’t look like anybody else’s, and we love that. Shout out to our LGBTQ couples just to be super duper clear—we LOVE you, and helping you celebrate your day is such a privilege. With a decade of experience behind us, we’ve got your back. We’ll help you preserve those fleeting feelings and moments—just as you experience them. When all the confetti settles, the story we craft together will allow you to step back into all the magic, again and again. Be utterly worry-free while we tend to your story and you bask in the dazzling start of an inspired, wacky, and wonderful marriage. Inspired weddings begin at $3600. Playful sessions begin at $600. We want to know you and understand what’s important to you. We already know you have a great story. The more we can get to know you, the more authentically we can capture and communicate that story. We won’t drag and drop you into something that could be meant for just anyone. Who you are is vital to your story. If you’re tender and quiet, or if you’re loud and crazy—that’s who we want you to be and that’s the story we care about telling. You’re throwing a party and inviting all the people who’ve been a significant part of your lives to come together and connect to each other. They’ve supported and helped cultivate your relationship. They may have never met, or may be total besties. They’re important to who you are individually and together, and can’t be overlooked! When we photograph your wedding, all the moments matter. It’s about you, but it’s about them, too—Dad laughing while Uncle Jim busts a move on the dance floor, Mom getting teary-eyed while you’re getting ready, your best friends in a drunken group hug, or your dog trying to nab a slice of cake while nobody’s looking. These are the bits and pieces of invisible string tying your wedding together, and this is what your story is made of. When we shoot together, be it on the day of your wedding, in a café, or in a forest somewhere climbing trees, we’re not composing a posed scene that will look impressive. We’re not going for trends or trying to put you somewhere because it’s going to win us attention. What we’re creating is something filled with energy and realness and genuine emotion—something that puts smiles on your faces, and makes you snuggle up to one another. We craft experiences that are worth having and then tell the tender/awesome/crazy stories of those experiences. Fun is more important than pretty and perfect. Fun is who you really are. And that wins out over cool every time. Adventure is where great photographs come from. So let’s have one. You like stuff. We like stuff. We might even love stuff. Okay, #truth: we definitely love stuff. But when it comes to sharing who you are and what makes you magic, we don’t need to use stylized tablescapes and trendy umbrellas and string art to somehow make you more special. You are already so special together. If you have crazy ideas you love, rad projects you’ve crafted, or other things you’d like to bring on our adventure, go nuts! We think they’re rad. But know this: that is not what defines you, and it sure isn’t necessary for great photographs. Cross my heart. Your longest-lasting friendships are built on a collected history, but the glue that truly holds you together is trust. You know you can count on them. They know you’d go above and beyond for them. Well, that’s our goal, too. We’re going to earn your trust from the start. That means we’re always transparent and honest, we reply quickly to your emails/calls, we answer your questions thoroughly, and when you make a change to plans, we’re adaptable. We give our 100% to everything from planning to way past the confetti settling. We want to help make this a simple and easy pressure-free process. Being stressed on your wedding day ain’t worth it. Being there for you is important to us, and making sure you are happy working with us matters. When I looked at these photos, it reaffirmed our gut instinct to choose you in the first place. There is simply no other photographer who could have captured the exact feel and style we had envisioned for our wedding. You also managed to take a perfect snapshot of our hearts. We think it has a lot to do with you being a truly good person. That shines through in your work.